Stood with my hood up, rocking the full waterproof image and ankle deep in mud I met Claire, a happy camper at Gloucestershire’s 2000 Trees festival. From under her waterproof cape she wipes off the water running down her face and comments, “to the untrained eye, this mud might look as bad as Glastonbury in 2007, but it really isn’t you know. You can glide through this mud without worrying about losing your wellies”. Looking around, it was clear that the mud and rain wasn’t dampening spirits. I asked Claire if she was having a good time and she responds with a wink and a smile, “the best”. I spent the last weekend at Upcote Farm, the home of 2000 Trees, trying to pin down exactly what makes this festival not just good, but bloody epic – despite the weather. 2000 Trees has become an integral part of the alternative festival scene and has consistently attracted me back. Founded in 2007 and selling just over 1,000 tickets it has grown in the last six years to four stages and attracting just under 5,000 festival goers. At the heart of the festival is an ethos to do it differently, to not succumb to the same old festival formula. In their own words, “as cheesy as it may sound 2000trees genuinely started with six mates sat around a campfire complaining about the state of UK Festivals…and their ever spiralling ticket prices, poor facilities and pursuit of profit at all costs”. This ethos of ‘doing it differently’ transcends the baseless words of small festival rhetoric into an exciting reality that can be seen penetrating every corner of the festival. The food is varied but it is nearly all local, sustainably sourced or organic. This commitment to great local food and drink permeates right through to the bars who stock Cotswold Lager. Their policies on using bio-fuels and their great recycling record have meant that they have won “A Greener Festival” award for their on-going commitment to environmental sustainability. Last but certainly not least is their commitment to booking the best new and underground music Britain has to offer. 2012 alone boasted a diverse line up varying from Lucy Rose to Pulled Apart by Horses. In addition, there was a continued emphasis placed on the local music scene in and around Gloucestershire. Local independent labels such as ‘I Started The Fire Records’ were strongly represented throughout the weekend and enjoy a close working relationship with festival. These artists join the likes of Frank Turner, Bombay Bicycle Club, King Blues and many more that have graced the small stages in the festival’s short six year history. Personally however the highlight of the whole weekend came in the form of a band that was completely new to me, the Bristol based trio ‘The Cadbury Sisters’. The three sisters blend a three part harmony with ease to create a melancholic but beautiful mix of contemporary folk. The festival’s commitment to bringing the best of new and underground British music, all of which has been personally scouted by the event organisers, has resulted in the festival becoming a firm favourite with the artists as well as the punters. As Chris T-T (Xtra Mile) commented to me, “The best bit was the family feeling that Xtra Mile artists had through the weekend; especially with Lockey and Marwood playing almost every year, Trees feels like the label’s home festival”. Pushed for a ‘worst part of 2000 Trees’ Chris T-T commented, “The worst bit was the plastic hexagons they laid down to help people get across the site; they had tiny holes in, so as you squelched on them jets of mud spunked up through the holes, right up your legs”. I think most festival organisers would take that if that was the worst criticism thrown at them. Late on Saturday night, by chance, I bumped into Claire as we were both walking down the hill back to the main arena and we talked some more about the festival and what we thought made a good festival epic. It was one of those pleasant festival conversations you have with complete strangers. As I walked away I wished her a good weekend. As an afterthought she shouted after me and said, “Isn’t everyone having fun though”. I responded honestly, “yeah, they are”. She then did my job for me summarising perhaps all that you need to know about 2000 Trees and said, “perhaps that’s what makes 2000 Trees epic?”. 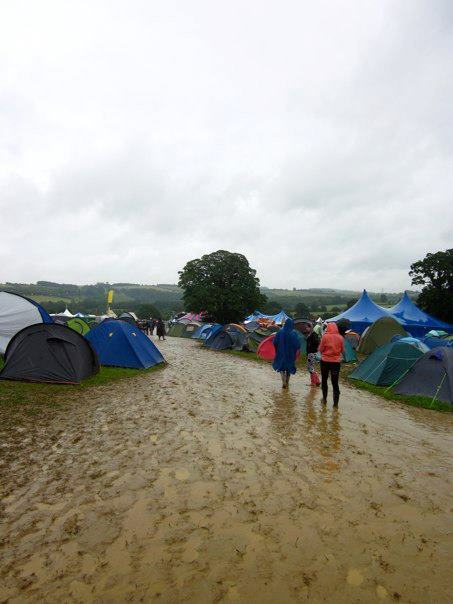 What an epic festival trees is – AND we had scones and jam for breakfast in the pouring rain.